For the past year, I have had the opportunity to work as an intern in the Research Room at the John F. Kennedy Presidential Library. Throughout my time doing reference work, I have seen a lot of interesting documents, and many of these have come from the White House Central Name File. The Name File serves as the alphabetical index to the mail that came into the White House during President Kennedy’s administration, housing correspondence between the public, President Kennedy, and his White House staff. The great thing about the Name File is that it allows reference staff to look up specific people to see if they corresponded with the President. Containing over 3,000 boxes (about 1,300 linear feet), the collection holds letters and telegrams from celebrities and notable figures of the 1960s, many of whom make appearances on the Library’s Facebook, Twitter, and Tumblr pages. JFKWHCNF-2577-013-p0023: Frank Sinatra’s telegram to President Kennedy, 28 August 1962. 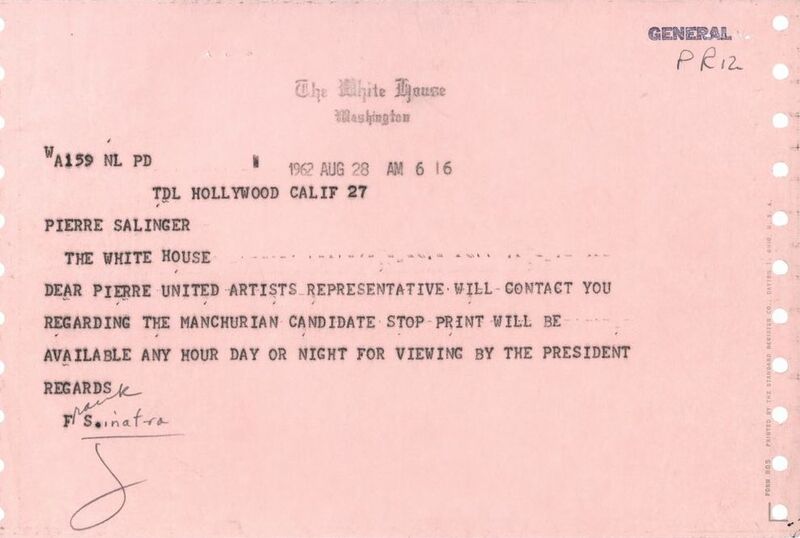 Here, he notified the President that a copy of the film “The Manchurian Candidate” was available for viewing at the White House. But my favorite thing about the Name File is seeing letters that ordinary Americans sent to the White House. While looking for a specific name in the collection, staff members get to see all of the other letters housed in the same folder. They reflect public opinion of the time, whether in support of Kennedy or in disagreement with him. We see firsthand what American citizens were concerned about and how they wanted to make the country better. Every folder has something interesting (or even amazing) in it, and it’s always been a pleasure for me to be able to work with this collection. JFKWHCNF-2466-009-p0040: This citizen wrote to President Kennedy with a suggestion: an eight-part plan for dealing with the Berlin Crisis. Because this collection is so easy for staff members to search, I decided to see if anyone from my family had sent anything to President Kennedy. 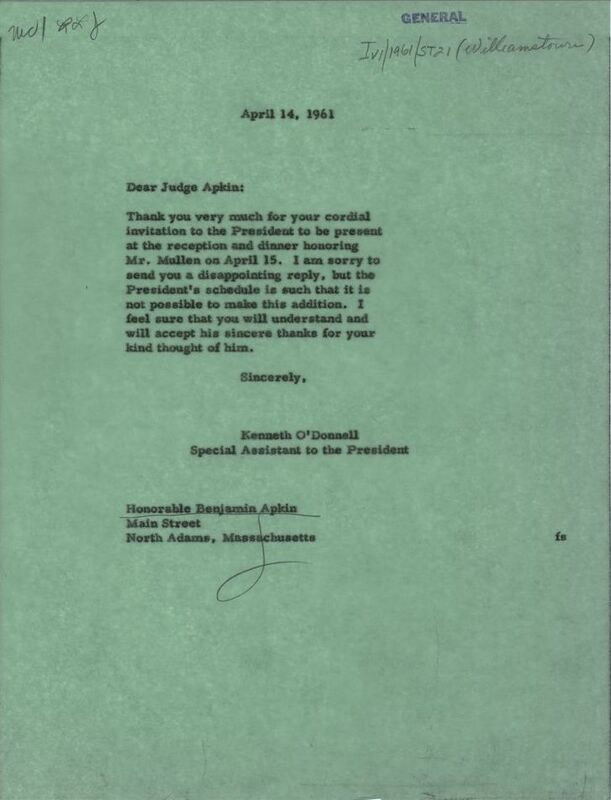 Without thinking this could even be a possibility, I looked through the “Api” folder in Box 80, and I was shocked to find that a carbon copy of a response letter from the White House to my great uncle, Judge Benjamin Apkin, was in the Name File. 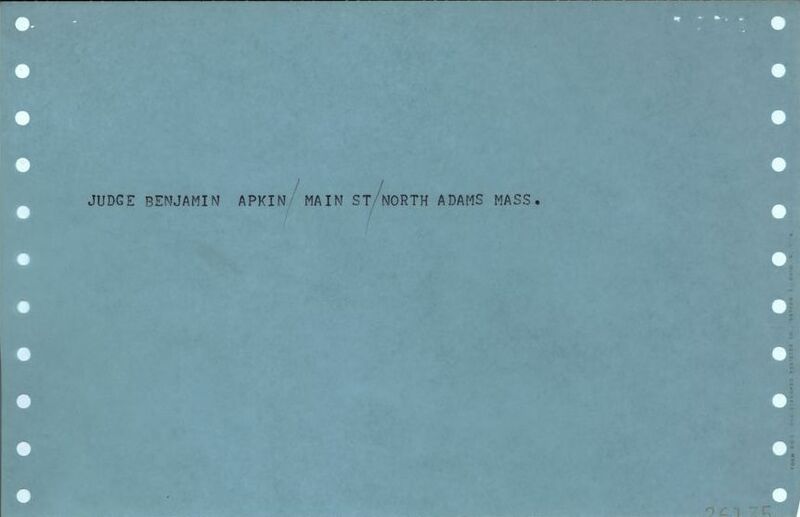 JFKWHCNF-0080-010-p0006: The response letter to Benjamin Apkin in the White House Name File, 14 April 1961. Often, this is what we find in the Name File – a carbon copy of a response from the White House, but no original letter from the person who wrote to the President. But there are some important clues provided by the White House to help us find the original letter: when a letter arrived at the White House, it was often assigned a code based on the topic of the letter; “HU” for “human rights,” “IV” for “invitations,” and so on – 62 codes in all. 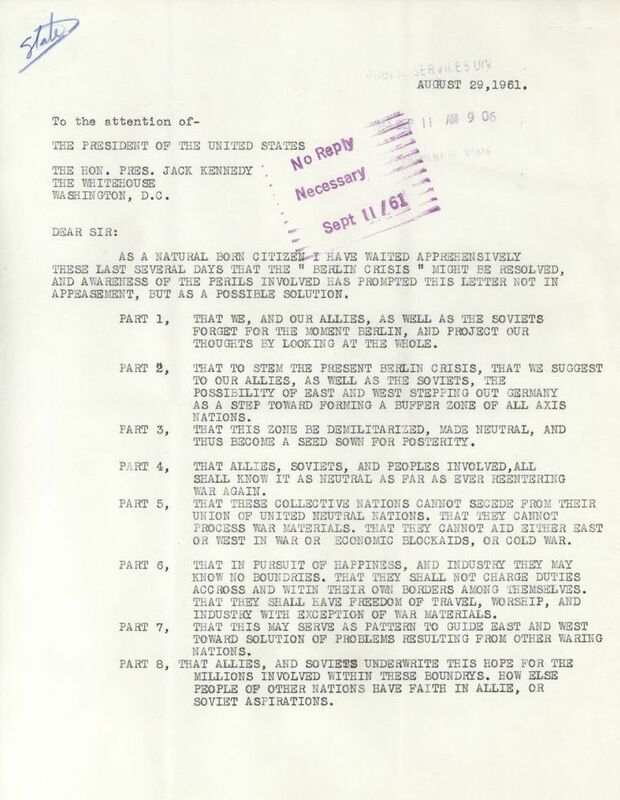 The White House response to each letter was copied, with one copy filed in the White House Name File (alphabetically by the name of the writer), and the other copy, often along with the original incoming letter, filed in the White House Central Subject Files (based on the code assigned by White House staff). The carbon responses in the Name File carry the subject code in the upper right corner, handwritten by White House staff and linking the carbon copy to any related documents in the Subject Files. This system, used by White House filing staff both well before and well after the Kennedy administration, gives archivists and researchers a way to search correspondence both by name and by subject. I looked up the code on this carbon (IV 1/1961/ST21) in the White House Central Subject Files, hoping to my uncle’s original telegram. Luckily, the system worked exactly as the White House designed it, and I was able to find it the folder titled “IV 1: 1961: ST 21(Massachusetts): W: General” in Box 400. JFKWHCSF-0400-007-052 and JFKWHCSF-0400-007-053: My uncle’s telegram to the President. 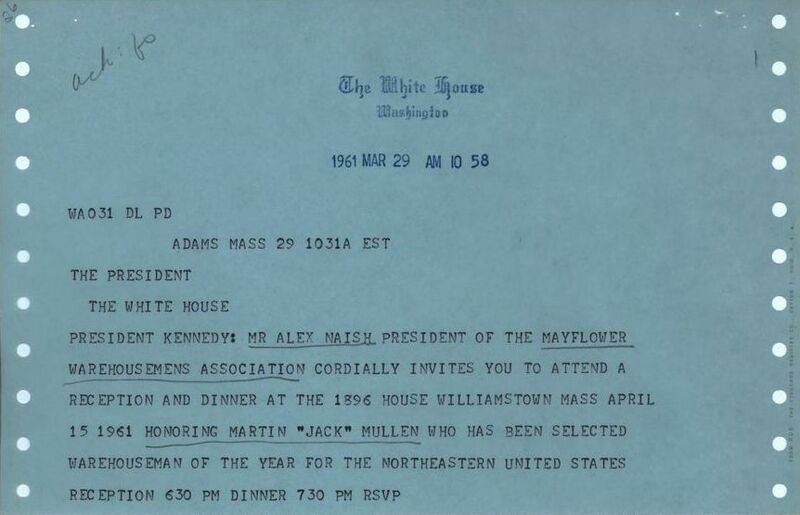 On behalf of the Mayflower Warehousemen’s Association, my uncle invited President Kennedy to attend a ceremony honoring the Warehouseman of the Year for the Northeastern United States in my hometown of Williamstown, Massachusetts. While this telegram might not be significant to most, it greatly affected me. I’m proud to know that my uncle’s telegram, however seemingly insignificant it may be, will forever be preserved in the John F. Kennedy Presidential Library archives. It also made me realize that every single letter in the Name File has significance to someone, somewhere. To me, the Name File is a treasure trove of letters that reflect the time period in many different ways and serves as an important and interesting tool for understanding our history as Americans. See some other examples of letters in the White House Name File here, or email kennedy.library@nara.gov for more information.